Baking with kids can be a messy affair, especially when it involves flour and raw ingredients. But it can be done. We like these two classic, no-fail, child-friendly recipes. We’ve given them a festive twist for the Lunar New Year season. Why not whip up a couple of batches together and share them with friends and relatives? Zest approximately half a large orange or tangerine. This zest should be kept in a porcelain or metal container until it is ready to be used. Do not place it in a plastic container as the acid from the zest may corrode the plastic. 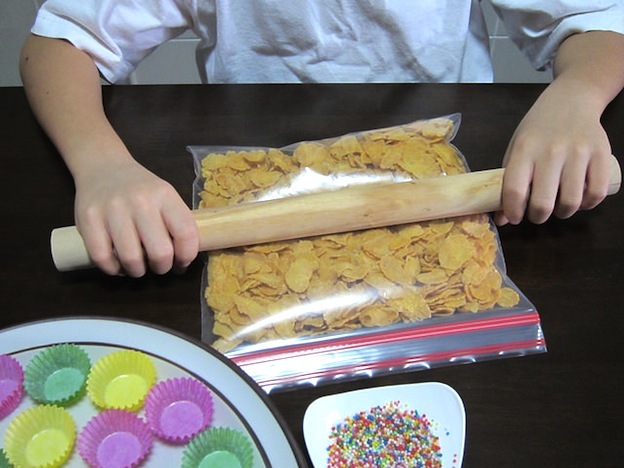 Place the cornflakes in a bag and gently crush them with a rolling pin or by hand until they are approximately one quarter the original size. Melt the syrup and butter over low heat on the stove until the mixture turns frothy. If you would like to reduce the sweetness of the recipe, start with the lower recommended amount of syrup. 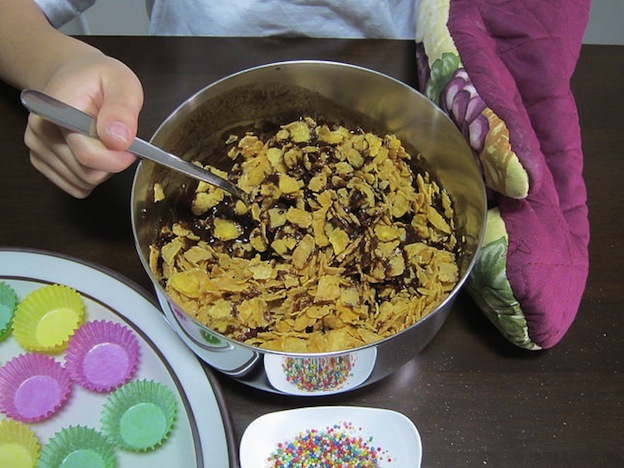 Increase the amount of syrup as desired after stirring in all the cornflakes in Step 4 and tasting the mix. 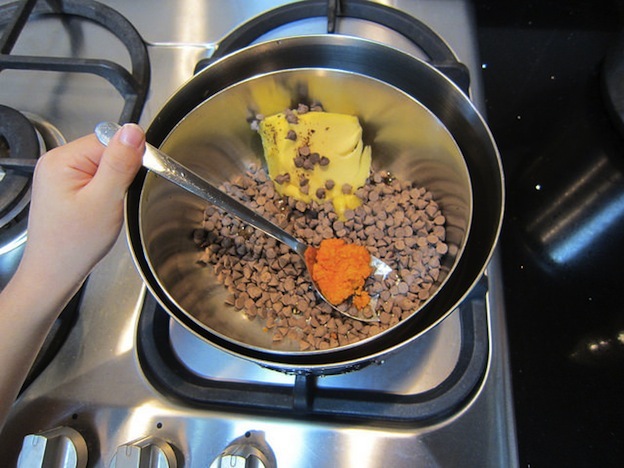 Place the syrup, butter and chocolate chips in a small metal bowl. Boil some water in a larger metal bowl, and place the smaller bowl inside the hot water. Keep the water simmering (but not boiling) while you stir till all the chocolate has melted and a smooth paste is formed. Alternatively, you can microwave the butter and chocolate chips in a porcelain bowl for 5-10 seconds at a time, stirring until all the chocolate has melted. After this, add the syrup to the mixture. Using either of the above methods to melt the chocolate will reduce the risk of burning the chocolate, as compared with heating it directly over the stove. Stir in the orange zest and orange extract (if using) until it is well mixed. Pour in the cornflakes a little at a time, stirring to ensure that they are evenly coated. 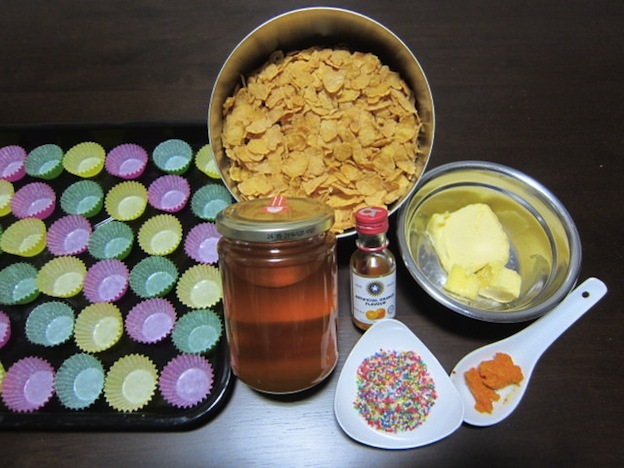 Leave some cornflakes out if the mixture gets too dry, or add more cornflakes if the mixture appears too wet. Arrange the paper cups on a baking tray. 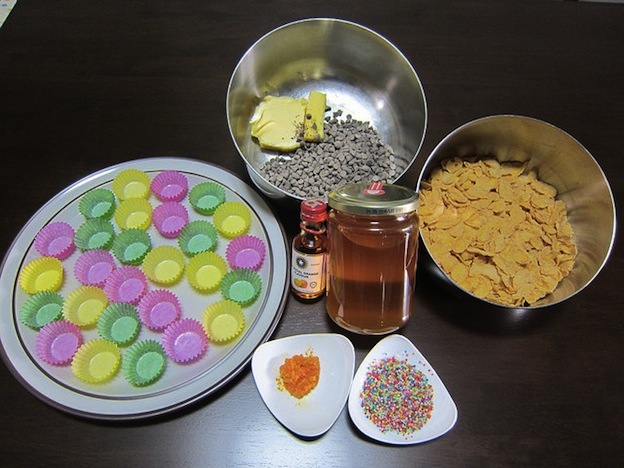 Using a small teaspoon, spoon the cornflake mixture into the paper cups and top each cornflake ball with some rainbow-coloured sprinkles. If you are making this with a young child, use medium-sized paper cups instead of small ones as this would allow your child to drop the mixture into the cups more easily. Bake the cookies in a preheated oven at 150°C for 10-12 minutes. Allow the cookies to cool before storing them in an air-tight container. 1. 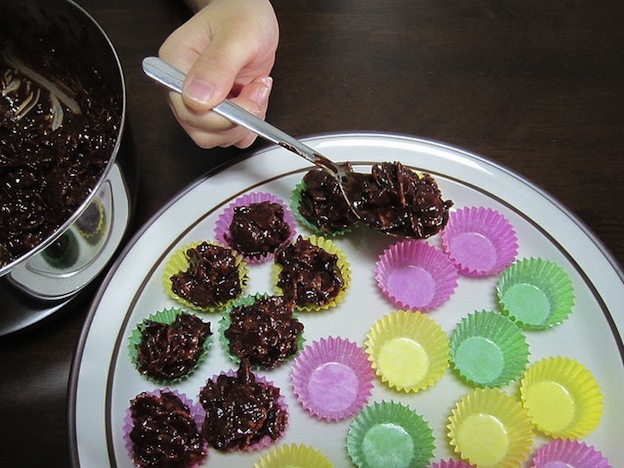 The chocolate-orange cornflake balls will set without baking. However, these tend to be soft and crumbly. Baking ensures that the cornflake ball holds together. 2. 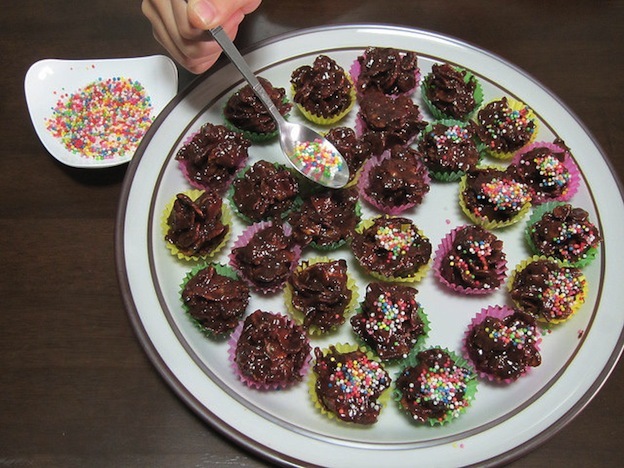 Do not store the chocolate-orange cornflake balls in the refrigerator, as condensation will form on the chocolate when it is removed from the refrigerator and spoil the look of the cookies. You can also add dried fruit and seeds to your cornflake balls or try these no-bake versions using nutella or peanut butter. Happy feasting, and do let us know how your versions turn out!